Washing machines are one of our great modern inventions! Such a convenience, we often take it for granted. Until there is a problem. When your washing machine fails, it can be catastrophic. According to the Insurance Institute for Business and Home Safety (IBHS), washing machine failures are in the top-10 of leading causes of residential water damage! Like we always say at Always Affordable Plumbing, the best way to keep it affordable is to prevent the big problems. Which is why we try and provide you with the best home plumbing tips and tricks (check out our PLUMBING TIPS here). However, if you find that you need and emergency plumber Sacramento, Always Affordable Plumbing is available 24/7! Here are some great stats from the IBHS on washing machine repair and water damage. These failures cost an average of $5,308 per incident after the deductible was paid. Failures of supply hoses accounted for more than half of all washing machine-related losses. Of the water supply hose failures resulting in water loss claims, 78% involved washing machines that were less than 11 years old. Of these failures, 54% occurred in washing machines between eight and 10 years of old. Although the affect of washing machine location on claim frequency could not be determined in this study, in the North Region, claims for units located in basements were 24% higher than claims for units located on the first floor. 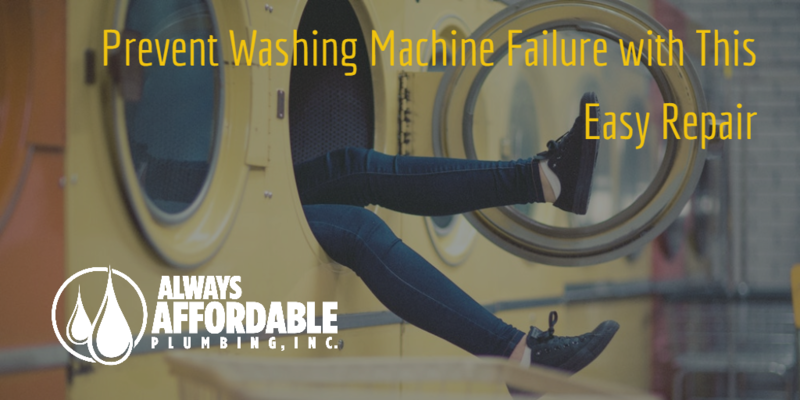 Approximately 6% of all washing machine failures occurred in unoccupied homes. Failures that occurred in unoccupied homes resulted in claims that were on average nearly two-and-a-half times more severe than those occurring in occupied homes. Over $5,000 in water damage, AFTER the deductible, is crazy! Especially considering that over half of these plumbing emergencies are related to something super simple and inexpensive: supply hose failure. Replacing your stock washing machine supply hoses yourself will only cost you between $15-$50. That seems like a worthwhile investment to prevent thousands of dollars in potential water damage!! Yet so many people don’t know that they should be inspecting and replacing their supply hose regularly (read more about supply hose repair HERE). If you are going to replace it yourself, which is fairly simple, we recommend investing in a high quality hose set. If you don’t want to spend the extra money on supply hoses, then just be sure to replace your hoses about every 3 years or so. Not ready to tackle this repair yourself? Always Affordable Plumbing can inspect your washing machine and replace your supply hoses, starting at just $199! Always Affordable Plumbing can inspect your washing machine and replace your supply hoses, starting at just $199! For a TON of information about washing machine supply hoses, check out FLOODCHEK. They are a great resource, and also manufacture some top of the line supply hoses. As you can see, it makes a lot more sense to get your washing machine inspected and taken care of before you end up with major water damage! CALL TODAY for a FREE home plumbing inspection to learn about any potential issues you may have. Should the worst occur, Always Affordable Plumbing is the best emergency plumber Sacramento has to offer!! CALL ALWAYS AFFORDABLE PLUMBING, 24 hours per day, when your plumbing emergency can’t wait! !